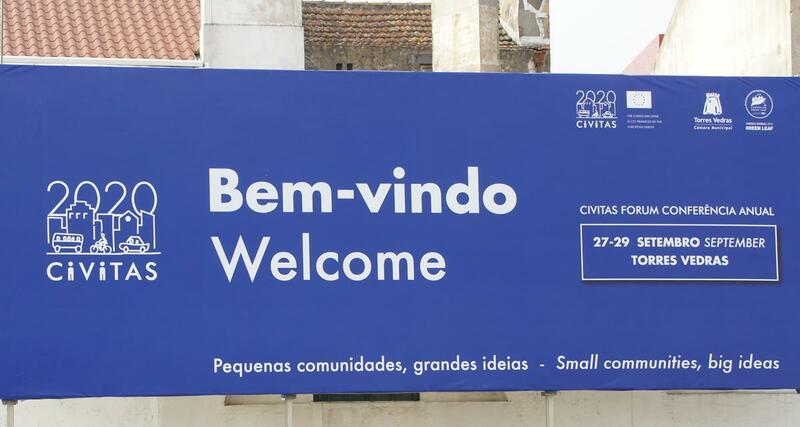 From 27-29 September, close to 500 participants convened in Torres Vedras, Portugal, for the 15th CIVITAS Forum. 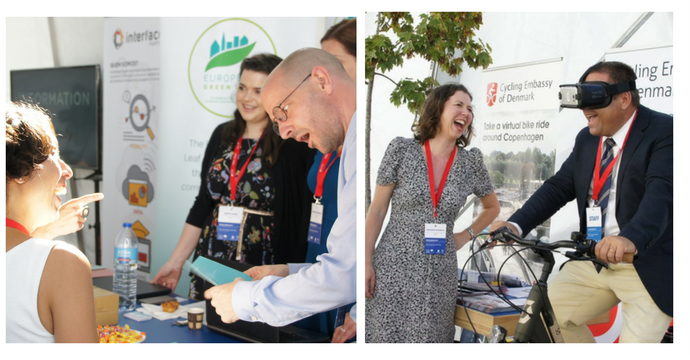 A diverse community of policy makers, practitioners, academics, and city representatives debated the most pressing issues surrounding sustainable urban mobility, and set out clear pathways for bringing cleaner, better transport to Europe. This year's Forum had the theme of “Small Communities, Big Ideas”. Across Europe, pioneering sustainable mobility initiatives are emerging from small communities, such as expert groups or small towns. The Forum gave them a platform to showcase their ideas and a wider audience the opportunity to experience them: it was proved that size is no limit to innovation. Initiating the changes that spur this innovation requires political courage, and there is an element of risk involved. At the opening plenary, both Carlos Bernardes, Mayor of Torres Vedras, and Steen Møller, Deputy Mayor of Odense and Chair of the CIVITAS Political Advisory Committee, outlined how their small cities had benefitted from taking that chance. During her plenary speech, Maja Bakran, Deputy-Director General at DG MOVE, spoke of the transformative effect that sustainable mobility can have on communities of all sizes. Plenary sessions opened and closed the Forum, with parallel sessions taking place each day. These covered a broad selection of themes, ranging from core sustainable mobility topics like collective passenger transport and demand management strategies to newer perspectives, such as mobility as a service, shared mobility, electric buses and freight vehicles, and connected and automated vehicles. Transport development should incorporate wider environmental, social, and economic concerns and, ultimately, be informed of people’s needs. To ensure this occurs, public participation and involvement must be fostered. Numerous sessions explored how to achieve this, for instance through the Sustainable Urban Mobility Planning approach. Workshops also examined the societal dimension of mobility, including issues relating to equity, public health, and the relationship between mobility and inclusion. Indeed, public support is crucial to sustainable mobility's growth. In his keynote speech on game changers in transport, Philippe Crist of the International Transport Forum affirmed this. One of seven he outlined was “activisation”, the growing support for walking and cycling worldwide. An audience poll afterwards named it the factor most likely to make urban mobility more sustainable over the next 20 years. Maja Bakran cited the efforts of EUROPEANMOBILITYWEEK (EMW) in mobilising public support for active and sustainable travel modes. In EMW’s session, five small cities introduced activities they had organised to get residents involved in and enthused by active mobility. Yet without the right tools, people cannot participate in urban and transport planning processes, nor can local authorities properly develop and implement the resulting plans. Thankfully participants seemed to enjoy Deployment Day! Deployment Day, a new programme feature, afforded cities and practitioners the opportunity to test over 50 urban mobility tools. Live presentations and tailored training workshops brought them to life. Demonstrations included those of the Urban Transport Roadmaps online scenario-building tool for Sustainable Urban Mobility Plans (SUMP), and the CIVITAS Tool Inventory. The latter, a searchable online database of over 100 urban mobility tools, was launched at the Forum. As CIVITAS is dedicated to better, cleaner transport in cities, it was apt that stimulating the uptake of energy-efficient vehicles was a key focus. Participants looked at successful factors for their deployment and tools and methods for reducing conventionally fuelled vehicle usage. The need for a business case with a clear financing model and funding strategy was mentioned by policy makers, practitioners, and city representatives alike. The EC’s new Clean Bus Deployment Initiative was also in the spotlight: a series of local politicians signalled their commitment by signing it at the Politicians’ Forum on the first day. A classic Forum feature, the CIVITAS Awards were again given out to pioneering cities turning sustainable urban mobility policy into reality. Prizes were available in two categories: Bologna (Italy) and Murcia (Spain) went home as winners, with Irun (Spain) and Joinville (Brazil) as runners-up. Click here for their stories. Following three dynamic and rewarding days, Umeå, Sweden, was revealed as the host of the CIVITAS Forum 2018. Materials from presentations and sessions at the Forum will be available online soon at civitas.eu/forum2017.